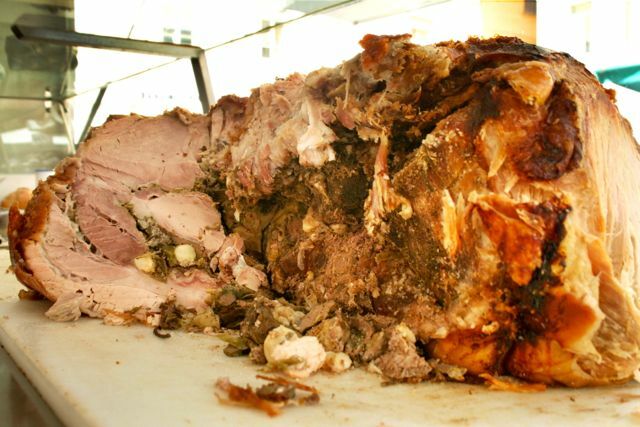 If you visit Tuscany & Umbria you are likely to come across road-side vans selling porchetta, wood fired oven roasted pig that is flavored with garlic, salt and fennel. They are also a common sight at markets and, porchetta, when served in a bread roll, makes a great snack. When I get porchetta at Umbertide Market it’s usually to take home for lunch – in this case I buy the bread from a local bakers rather than the rolls on offer from the van. To make a porchetta, the pig is deboned and the offal is boiled with garlic and fennel before being put back into the carcass and roasted in a wood fired oven for several hours. I like to ask for “magro” porchetta which means the bits without too much fat, you might also be offered bits of the offal which you can decline if it’s not to your taste. Diehard porchetta fans can ask for ears and other slices from the pig’s head, cheeks are considered particularly good.